When you think of countries that produce amazing beers, do you think of Switzerland? 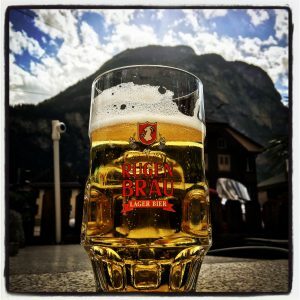 Is Swiss beer on your radar? But after umpteen trips to this beautiful country I thought it was time I did some research and learned more about what was on offer. The boyfriend and I checked in to a hotel in Innertkirchen in the heart of the Swiss alps after a long and hot day on the motorbike. We ditched the biking gear and headed outside to the bar. “What beers do you have?”, I asked and the waitress said: “Rugenbräu“. I stared at her waiting for the rest of the list, and she stared back. There was no list. Funnily enough we opted for the Rugenbräu. I’m a fan of strong and malty beers so I’ll admit I sometimes find lagers a bit watery and disappointing. But not that day. We were melting in the heat and the big chunky tankard of Rugenbräu Lager Hell hit the spot. And there was something nice about knowing I was drinking a local beer, brewed in nearby Interlaken which was the next stop on our journey. We went the long way round. Instead of the direct, 40-minute route we had some fun on three great mountain passes – Susten Pass, Furka Pass (as seen in Goldfinger) and Grimsel Pass – before ending up back where we started and heading on to Interlaken almost five hours later. By then we were thirsty. 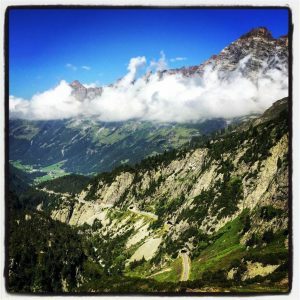 We unpacked our luggage to make space on the motorbike and headed into the centre of Interlaken to our favourite bottle shop – Waldegg-Keller. It prides itself in being the largest beverages market in the Bernese Oberland with more than 130 beers as well as hundreds of wines, spirits and culinary treats. To mark International Beer Day we loaded up our basket with a mix of beers from Switzerland, Austria, Belgium and Germany and grabbed some nice meats and cheeses, and when we got to the checkout the very nice man who runs the shop even threw in a few freebie cans. I liked him. His deadpan exterior was betrayed by a twinkle in his eye and he definitely knew his stuff when it came to beer. 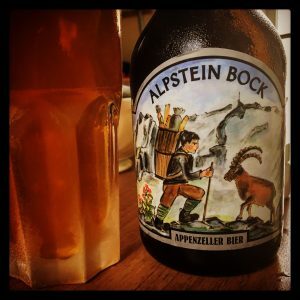 Less than 24hrs later we were back for more after falling in love with a beer called Alpstein Bock from Appenzeller Bier – the shop guy gave us some advice on Swiss beer and told us it was his favourite Swiss brewery. He even gifted us two free packets of crisps (‘tschipps’) made by Appenzeller using barley malt, a by-product of its brewing process. On our way out the door he cheekily but knowingly shouted: “See you tomorrow!”. Another place in Interlaken worth a mention is The Barrel Artisan Cafe. When I first visited years ago it was simply a bottle shop and the Aussie guy who ran was cheery and helpful. It has since moved across the street and tagged on a trendy cafe selling artisan light bites. I thought its Belgian selection had shrunk a little since my last visit but there was still a sizeable collection of hundreds of other options. A stone’s throw away is another great place called Hüsi Bierhaus, which is perfect if you want to sit in, drink nice beer and eat classic gastro pub food. It serves 90 local and international beers and you’ll find everything from burgers and ribs to pork knuckle with crackling. The place is always mobbed, in a good way, and bursting with atmosphere. Of all the Swiss beers I tried, Appenzeller’s Alpstein Bock was hands-down the winner. Just when I’d conceded most Swiss beers seemed to be light and lagery (which was actually perfect in the scorching heat) this little beauty came along. I was hooked from the first sip of this aromatic, dark blonde beer which had a fair bit of oomph at 8 per cent. Appenzeller say their beers taste so special because they use fresh springwater taken directly from its source from the legendary Alpstein. It worked for me! I also tried out its Quöllfrisch hell (4.8%) which was lighter and yeastier. While I wasn’t quite so keen on Köhler beer, a crystal clear amber at 4.8%, it has an interesting history. It was supposed to be a one-off from Karbacher brewery but was mass produced due to popularity. And when beer production had to shut down due to the poor health of its creator, The Brauerei Locher AG took on production to preserve this special beer. Rugenbräu Lager Hell (4.8%) was a light and refreshing sunny day drink and I also tried the brewery’s Zwickel Bier (4.8%), my first ever try of an unfiltered beer – though by comparison I preferred the lager. Rich’s Chocolate Porter from Beir Factory Rapperswil AG (5.5%) was fizzier than expected and had a full-on flavour. Rich by name and by nature, it had a strong bitterness that reminded me of an 80% dark chocolate bar. One was more than enough. Last on the tasting list was Burgbier’s Roter Baron (5.4%), a red ale that I hoped would be maltier and sweeter – inoffensive but didn’t get me overly excited. 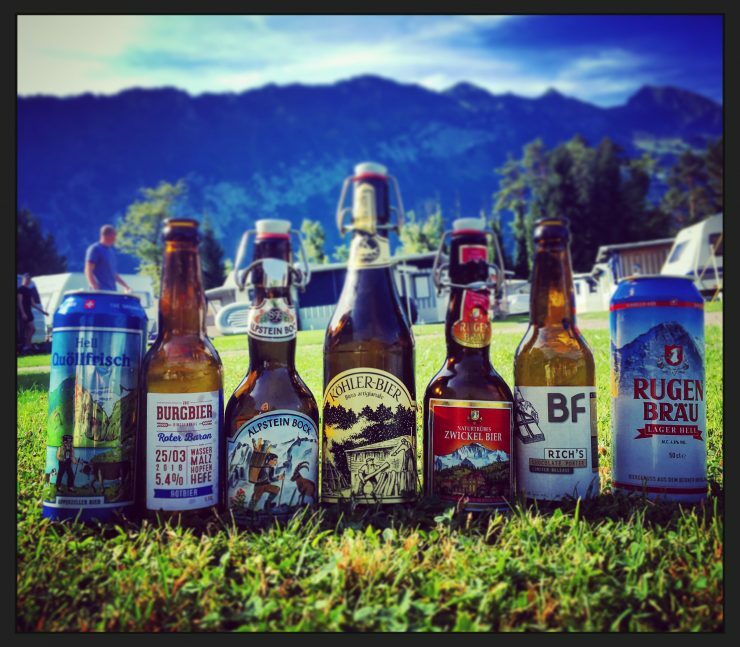 These beers opened my eyes to just some of what Switzerland had to offer. I’ve since looked into what else is out there from the country’s breweries, and I suspect this is just the start of this research mission!